The Original BOATRULE fish measuring ruler was created by Ninemile Fishing Company with boat anglers in mind. By using special adhesive-back vinyl, we are able to produce a flexible ruler that stick to aluminum, fiberglass, plastic, glass and even your canoe paddle and landing net. 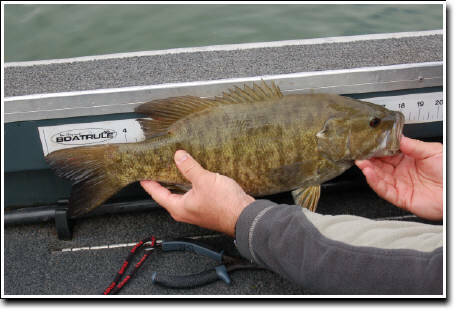 The Boatrule measuring decal is both durable & waterproof, capable of measuring miles of fish. With black numbers and 1/4" increments, the BOATRULE is easy to read in tough fishing and weather conditions. The large print is also a plus when you need to prove to your buddies that your catch is a trophy. After all, pictures don't lie and neither does the BOATRULE. Available in 36", 48" and now 58" long measuring decals. Made entirely in the USA and guide tested tough! The BOATRULE fishing ruler is a perfect addition to your freshwater or saltwater fishing arsenal. Whether you fish for crappie or bass, walleye or Musky, Bonefish or Redfish, trout or salmon, even king fish or strippers we have a BOATRULE to measure your next catch.